The OU actually permits the kashering of Keurigs for Pesach, but if you're like us and don't kasher plastic items, you might be on the lookout for a new Keurig k-cup coffee machine for Passover. Rather than spend big bucks on a name brand Keurig for a machine that you will use for one week out of the year, consider this lower-priced Chulux Single Serve Coffee Maker that uses k-cups (just like a Keurig) for about half the price of the lowest-end Keurig. 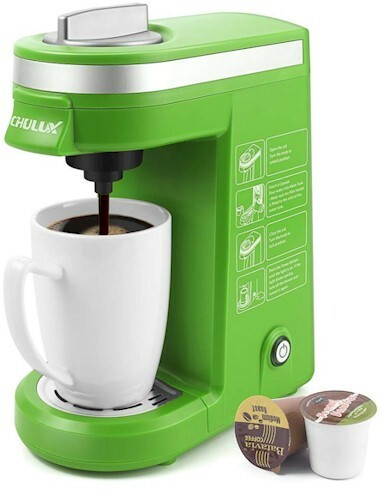 Amazon has got the Chulux Single Serve Coffee Maker in green priced at $39.99 - $5.00 online coupon = $34.99 with free Prime shipping. It also comes in other colors, black, blue, orange and red for $39.99 - $4.00 online coupon = $35.99 with free Prime shipping, just a dollar more. 3.8 out of 5 stars over 3,312 customer reviews. Compact and Portable - With the most compact design and durable construction in the market, the CHULUX Coffee Brewer is perfect for home, office, dorm room, apartment, caravan, etc.